In the past week we have posted stories about the anti-vivisection work of West Michigan for Animals (WMFA) and their campaign to fight animal abuse at area rodeos in the 1980s and 90s. 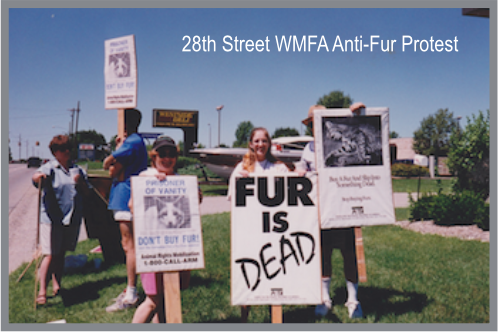 WMFA was also deeply committed to resisting the cruelty cause by the fur industry in West Michigan. 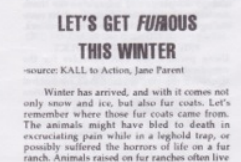 Anti-fur organizing also began in the late 1980s in West Michigan and we have some details from archival materials on that work. According to a newsletter from August of 1995, Cole Dorsey was head of the Anti-Fur Committee. A high school student at the time, Cole was deeply committed to resisting animal cruelty, especially what was perpetrated by the fur industry. 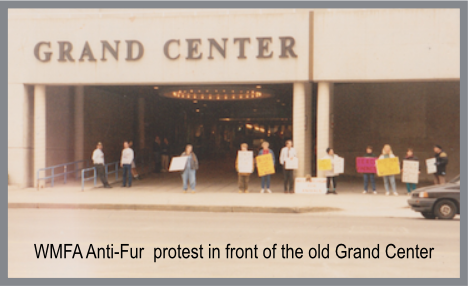 The Grand Rapids People’s History Project spoke with Cole recently and asked him to share his thoughts on the anti-fur organizing from 20 years ago. “A lot of our actions in WMFA, when I was a member, targeted fur stores and fur wearers. At that time there were 4 stores selling furs in Grand Rapids. They were: Leigh’s Fur Salon, Cascade fur salon, Jacobson’s, and Hudson’s. We regularly picketed each location. The pickets became increasingly more militant. We started blocking/interfering with driveways and entrances. It got to the point that at the cascade fur salon the owner would call the police as soon as he saw we showed up because he expected a confrontation. Jacobson’s and Hudson’s were department stores inside larger malls. In east Grand Rapids and Kentwood respectively. At that time PETA was producing posters with a picture of a skinned animal with the words “Fur is Dead” on them. A member had the idea to secure the posters on the back of our coats and go into the stores as costumers shopping. We were able to make a couple of visits like that to each store before they began recognizing us and kicking us out upon entrance for “creating a disturbance”. However, the WMFA newsletter piece then goes on to encourage people to make their anti-fur sentiments known, by wearing buttons, putting out literature and wearing a fake fur coat with red paint splattered on it. In addition, the newsletter states many fur stores had closed in recent years because of the education and organized resistance. This result, was in part, due to the efforts of West Michigan for Animals. This entry was posted in Animal Rights/Animal Liberation and tagged anti-fur protest in Grand Rapids, Cole Dorsey, Compassion is the Fashion, Direct Action Against the fur industry, West Michigan for Animals anti-fur campaign. Bookmark the permalink.